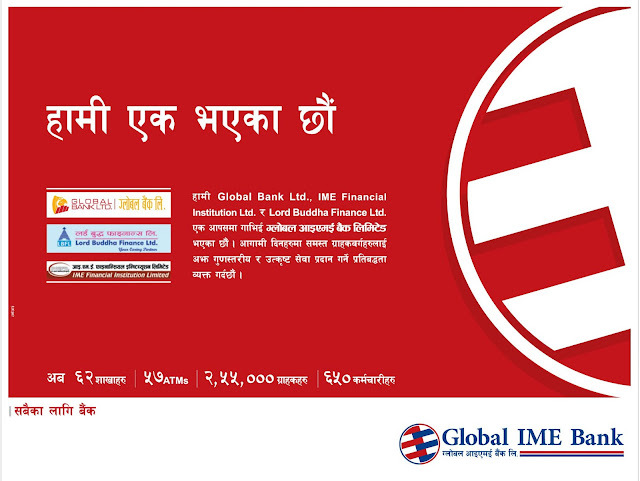 One of the renowned banks of Nepal, Global Bank has merged with IME Financial Institution and Lord Buddha Finance. The bank will now operate with a new name Global IME Bank. The bank now has a total of 62 branches, 57 ATM's, 255,000 customers and 650 staffs. Machapuchhre Bank has also merged with Standard Finance. Couple of weeks back Bank Of Asia also merged with NIC Bank.